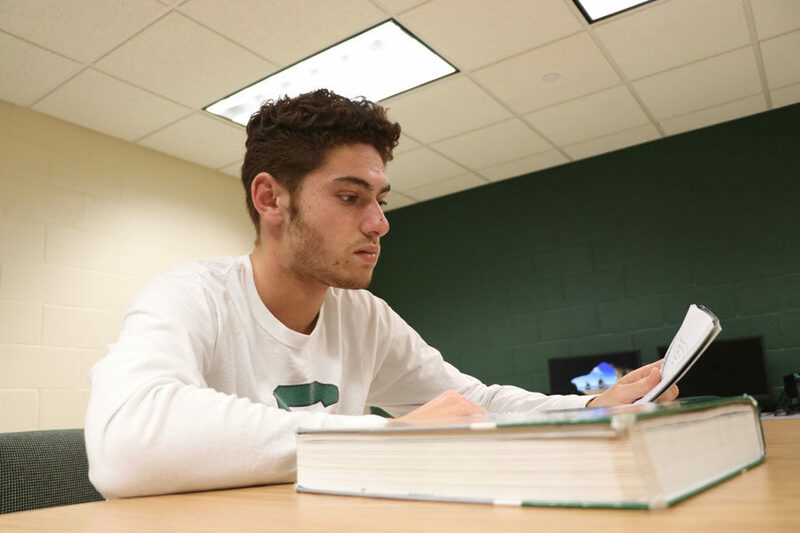 When Rousset is not practicing his tennis skills, he is studying for classes. Rousset has As and Bs in all of his classes at SCCC. 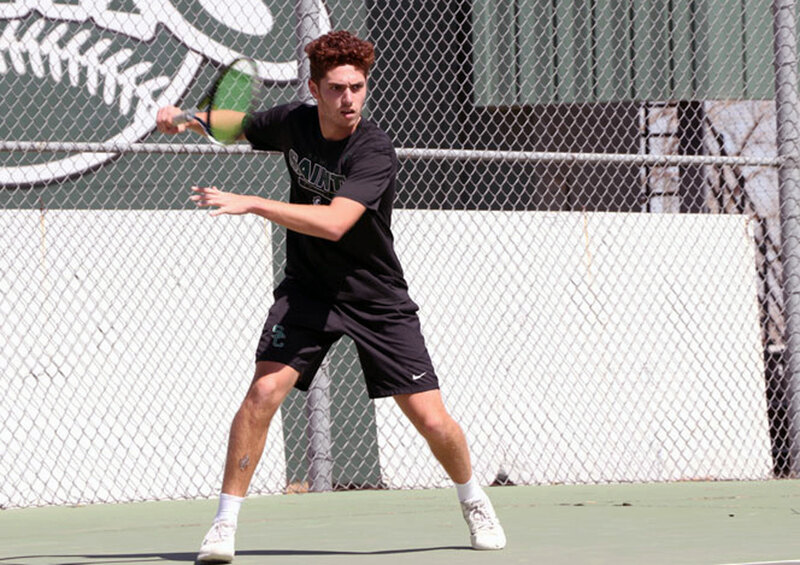 Coming from Plaisance, France, Nicolas Rousset began his tennis destiny in the United States at Seward County Community College. Rousset is a freshman tennis player and has brought a lot of national attention to the Saints’ tennis courts. “I started playing tennis at age seven. I chose to come play tennis here in the United States because in France, it’s very difficult to do both college and sports. I also chose to play tennis in the U.S. because it was financially easier to compete at a college here than at France where I would be paying to compete,” Rousset said. Rousset decided on SCCC because of how high the college is ranked in tennis nationally. 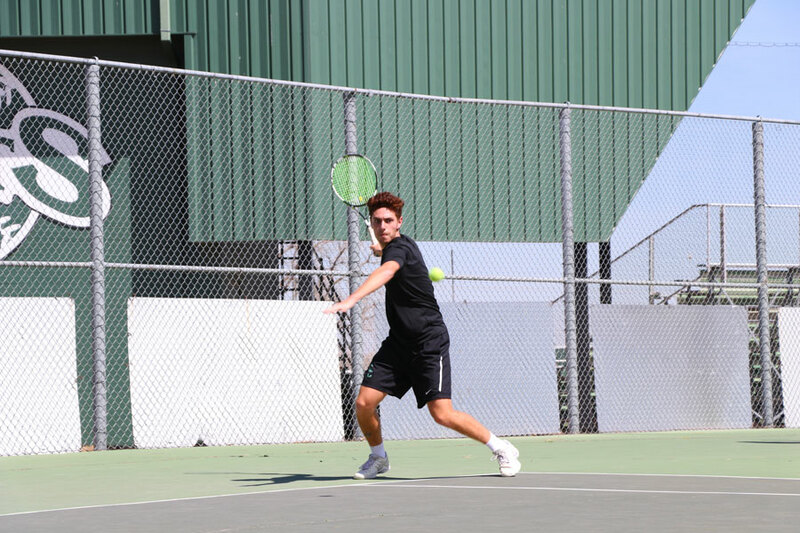 “I chose to come to Seward County Community College because it is the fourth in the nation in tennis. The coach was very interested in me playing for him, so that was a bonus. 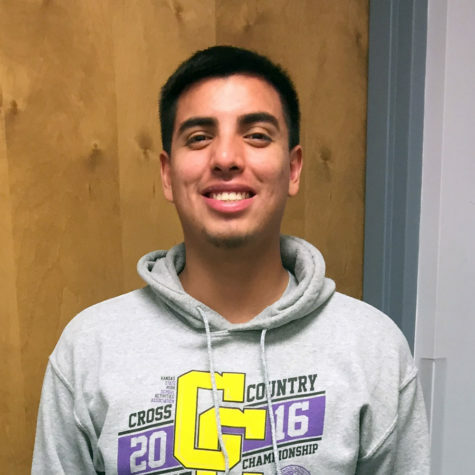 I talked to Coach Owen and had to send him some highlight videos,” Rousset said. Rousset’s perseverance on the court is one of the qualities his coach notices and appreciates about him. “Nick brings a lot of great qualities and skills to the court. He is an ultimate competitor with a never say die attitude. 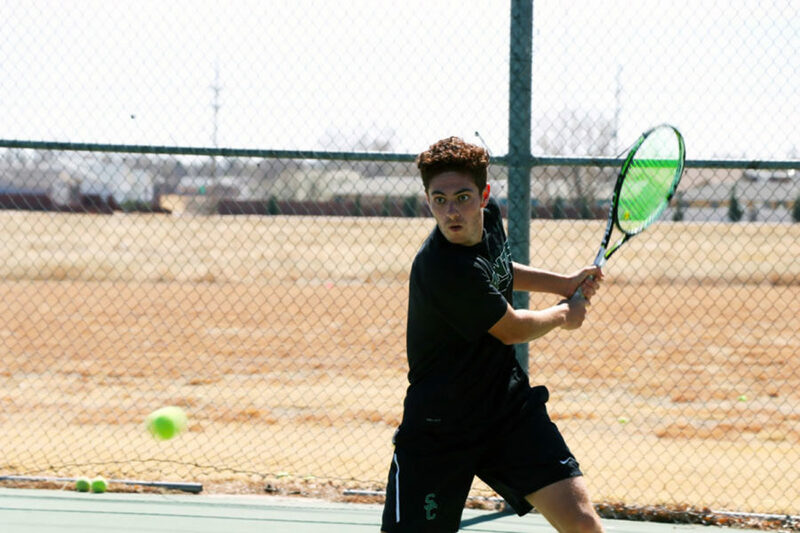 His ability to control his body and handle pace from his opponents is one of his greatest strengths along with his ability to just change speeds,” SCCC Men’s & Women’s Head Tennis Coach, Chase Ashley said. Rousset's coaches say that his "ability to control his body and handle pace from his opponents is one of his greatest strengths along with his ability to just change speeds" is what makes him a phenomenal athlete. Rousset’s determination to win is not only noticed by the coaches, but by his teammates as well. “My first impression of Nick when I saw him play was that he is a great tennis athlete. Nick is like a lion on the court, he never wants to lose. Other people during tennis matches they give up, but not Nick. Nick will fight until the end and he will always come out on top. Overall, Nick is a very good friend and a great tennis player,” Freshman Tim Lamare said. Strong strokes and smooth transitions have Rousset’s coaches excited to watch his matches. “I think Nick has an amazing talent. He is one of the most talented players that I’ve seen personally. His will to win is just something I’ve never seen. He has a different level that he can turn on during matches and the way he hits the ball is just mind blowing. His strokes are amazing to watch. Overall, he’s just a great athlete,” SCCC Tennis Assistant Coach, Lachmond Bratton said. In France, Rousset is one of the top players in the country. He has competed at the French championship in doubles and singles. He was a finalist in the French championship in doubles category and has won more than 25 tournaments. As for at Seward, Rousset’s record so far is 23-2. He has won regionals and finished fourth in the nation. As for spring, it has been complicated for him due to an early season injury. Rousset says he wants to work hard at every practice and to do better, so he can come out on top and win nationals. Rousset had many offers from universities asking him to play for them before his regular season actually started. Although he has a couple of offers, he is still undecided. He will decide where to attend depending on how next season goes. He is aiming to attract schools from Miami or New York. Assistant Coach Lachmond is confident that Rousett’s skills will land him in a Division I school. “Nick is a division one talent for sure, hands down, no questions asked and no doubt about it. Any DI school would love to have Nick in their roster,” Lachmond said. Rousset is one of the top tennis players in France. He has been a finalist in the French championship in doubles category and has won more than 25 tournaments. Rousset's is a potential Division I tennis competitor. He hopes to receive offers from DI schools near Miami or New York. Although Rousset has another year to compete at a JUCO level, he already has high expectations, not only from himself, but from teammates and coaches. “Nick, as well as the team, will always have high expectations. I expect Nick to own his spot. Whether that’s number one or two or six. We need players to win matches and help this team compete for a Regional and National Championship. I think this off-season, Nick can improve his overall quickness along with developing a more dangerous and consistent first serve,” Head Coach Ashley said. 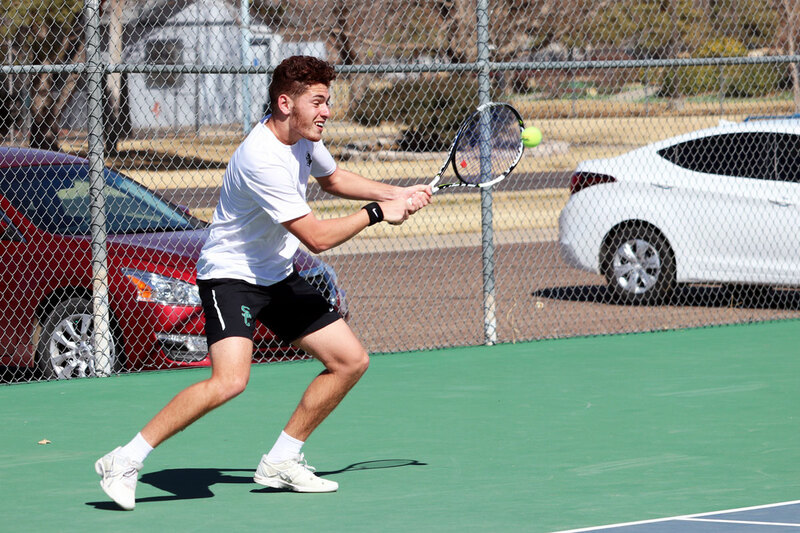 For both the SCCC Tennis team and for Rousset, there is one goal: to win nationals. “My goal for the remainder of the season is to win nationals. My strength on the tennis court is my mentality. I never give up and I try to do my best at every play I do. While I am here at the U.S., I just want to be the best I can possibly be. Overall, I just want to make my homeland proud and represent my country,” Rousset said.